After shooting in and around New Jersey and up in the Adirondacks I headed south to my final destination, Shenandoah National Park in Virginia. Never having been there for the fall colors I was purely guessing on when it would be considered peak. Researching online proved to be somewhat helpful as I began to hone in on a week that had the best potential. Feeling confident I made reservations a month ahead to stay in Waynesboro Virginia and was hoping I timed it right. In hindsight, I’m learning there really is no science to predicting fall colors. I wanted to spend some time with my brother in law who lives outside of D.C. so I picked him up and we drove another two hours to the southern terminus of the park. 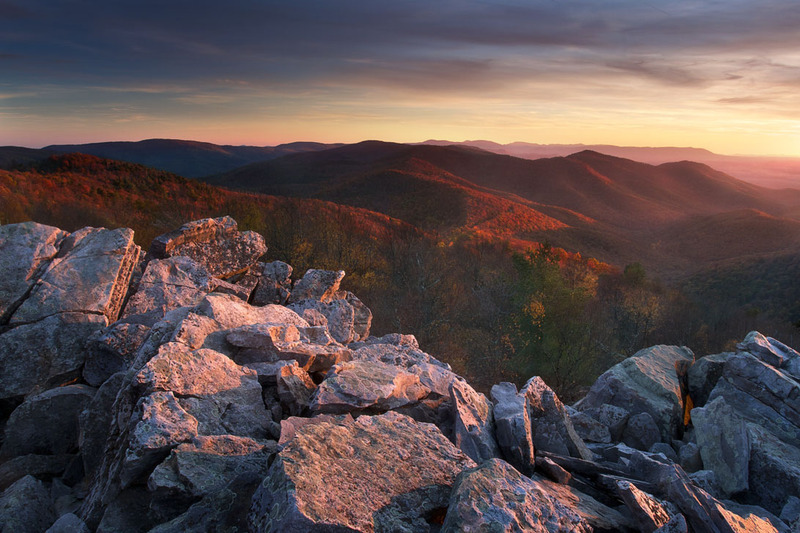 Shenandoah National Park is a thin park that sits on the Blue Ridge Mountains in Virginia. The park is probably best known for having the Skyline Drive that dissects the park from Front Royal to Waynesboro. A motorcyclist dream, Skyline Drive is a two lane road that winds around and up and down the mountains. The park itself has so much to offer with plenty of hiking trails, camp grounds and some lodges spread throughout. Needless to say it can become very busy but surprisingly it wasn’t as crowded as I expected. My plan was to shoot multiple locations but I had my sights clearly set on one particular spot and that was Blackrock Summit. If I only get one shot this was going to be it. I’ve seen images from this location over the years online and was anxious to get to see it for myself. Having never been there before I wanted to get there with plenty of time to find the best composition to shoot. We got to the parking lot and found the trailhead and began the easy hike out to the summit. Not long after we started we arrived to a giant collection of rocks known as Blackrock Summit. A short climb to the top revealed incredible 360 degree views but especially amazing were the ones to the west. Mountains lined up in a row creating amazing depth and shapes. I never get tired of views like this. Having tried several compositions I settled on this one using the rocks themselves as a strong foreground element. Once set, we waited for 2 hours for the sun to get lower on the horizon. It’s amazing what you can chat about waiting for the perfect light. News flash – Shooting landscapes is all about patience…..a lot of patience. As the sun lowered to the horizon it shot straight through the valley and reacted with the mountains just as I hoped. It was absolutely incredible. This light lasted for less than a minute but it was exactly what I hoping for. If it was warmer we might have stayed and shot into the night but by the end of this shot I couldn’t feel my fingers. The temperatures dropped quickly and the wind was whipping across the tops of the peaks. So we packed up, attached our head lamps and hit the trail back to the car. I was determined to get this shot and was excited to know that I got it on my first night in the park.